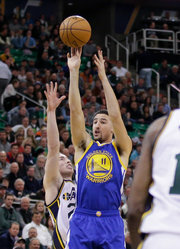 Golden State’s Klay Thompson shooting over Utah’s Gordon Hayward during the second quarter in Salt Lake City. Stephen Curry scored 26 points, and the Golden State Warriors held on for their N.B.A.-record 19th consecutive win to start the season after a 106-103 victory over the Utah Jazz on Monday night in Salt Lake City. With the game tied at 101-101 and 51 seconds left, Curry hit a 3-pointer from the left wing to give the Warriors the lead. Rodney Hood scored 14 seconds later to cut Utah’s deficit to 1. After Curry missed a 3-point attempt, the Jazz had a chance to take the lead, but Hood missed a 3 from the wing with five seconds left. Curry hit two free throws to seal the victory as Gordon Hayward’s halfcourt shot at the buzzer fell short. Klay Thompson added 20, including four 3-pointers. The Warriors have won 23 straight regular-season games dating to last season.